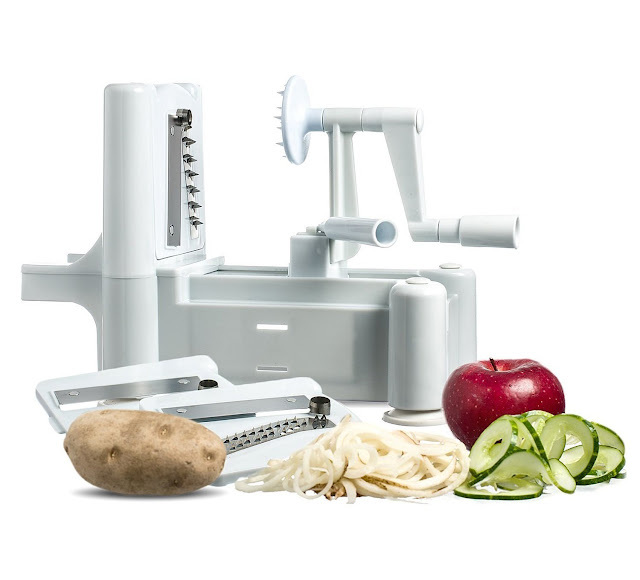 After using this a dozen times in my home, I have to say that I really like this Kuuk 3 in 1 Vegetable Spiralizer. It is so simple to use, anyone should be able to take it out of the box and start using it. It comes with 3 total attachments which easily slide and lock into place. Plus there is a area on the side to safely store the blade attachments when not in use. I have used all 3 attachments with veggies and fruits, and each time I got the perfect results that I was looking for. PROS: Easy to use, comes with 3 attachments that are easy to use, has suction cups on the legs to keep it in place when using, easy to clean, has storage area for attachments not in use, works so easily! CONS: Can be messy when using with fruits (the juice goes all over), has a semi cheap plastic feel. It feels awesome to try an electric spiralizer to prepare varied kinds of salad and recipes, and present them beautifully.